During recent excavations in advance of house construction at Bellfield Farm, North Kessock a number of Iron Age round houses and pits were discovered. 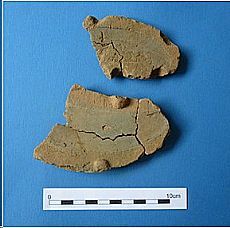 Some of the pits contained Bronze Age pottery and metalworking debri s, including fragments of baked clay moulds. Trevor Cowie at the National Museums of Scotland analysed the moulds and discovered that they were used to create sickles of a late Bronze Age type. This is quite exciting! The site is only one of a handful known in Scotland where late Bronze Age metalworking took place. The type of sickle itself if rare, with only five known from Scotland, three surviving including the example from Dores shown to the right. The North Kessock and District Local History Society is launching its ‘Feats of Clay’ project this month, a community heritage project to investigate and promote the context of these finds. Analysis of the moulds will be undertaken, while at the same time local people will pool memories of clay sources in the area, investigate old maps, and obtain some samples to compare with the mould fragments. If you know of any clay sources in the North Kessock area, please let us know by emailing info@archhighland.org.uk. The first session to share memories of clay sources will take place on Monday 26th August at the North Kessock Mission Hall at 7:30pm. The clay investigations will be followed by a short course on the Bronze Age in the Moray Firth run by Susan Kruse of ARCH for three weeks beginning 18th September. Then on 5th October, there will be a crafting day at North Kessock Village Hall, where Neil Burridge from Cornwall will produce replica sickles and other metalwork, and a range of other Bronze Age crafts will be on offer. 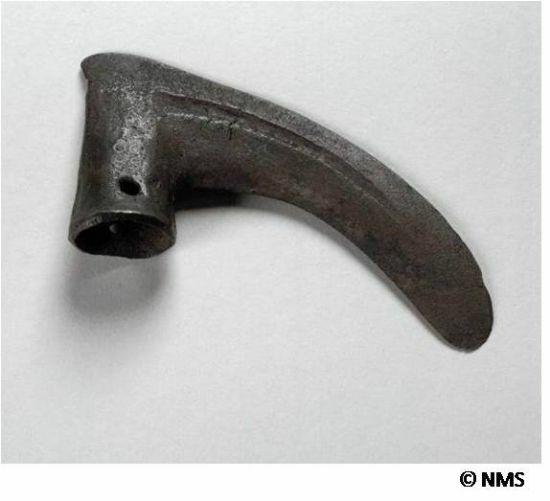 Later in the autumn there will also be opportunities for people to help research and photograph Bronze Age metalwork from the Moray Firth area, which will be showcased in a book to be written by Trevor Cowie. And finally in 2014 the North Kessock and District Local History Society will pull all of these strands together in its annual exhibition. Altogether it adds up to an exciting programme focussing on the Bronze Age in the Moray Firth area! Further information about the Searching for Clay Sources and the Bronze Age in the Moray Firth courses can be found on the ARCH website in the events section. The Feats of Clay project is funded by the Heritage Lottery Fund, Highland Council and StemNet’s Talking Science programme run by UHI.